Build a crime-fighting adventure with the LEGO 60141 City Police Station. With 3 levels of action and 7 minifigures, this feature- packed set is perfect for police fun. Stage an attempted escape in the LEGO 60141 City Police Station! The crooks have a cherry picker to bust their friend out of his cell—and with the dynamite element and exploding wall function, their plan might just work! Raise the alarm from the watchtower and lift the barrier gate to help the police go after the crooks with the pursuit car, motorbike and police helicopter. Extend the rotating cherry picker on the crooks’ truck and spin the helicopter’s rotors for more police action. There’s even a lever to launch the police car from the garage! 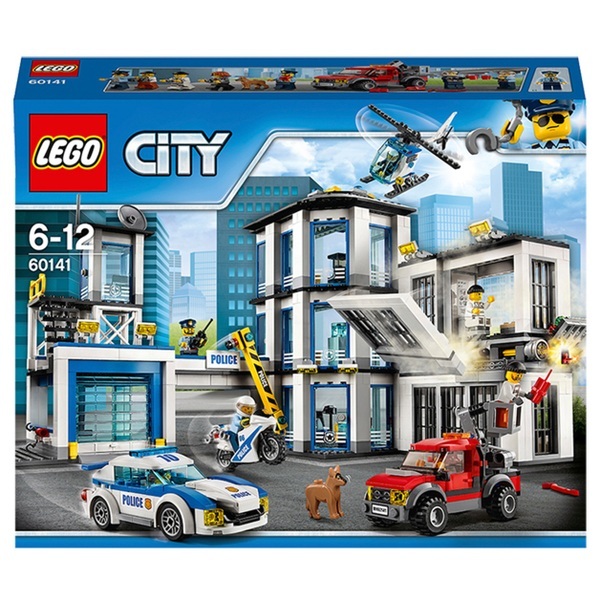 The LEGO 60141 City Police Station features 2 jail cells, 3 offices, a garage with tools and an opening door, a rooftop helipad, searchlights and an overhead walkway. This set comes with 4 police officer minifigures, 3 crook minifigures and a police dog figure. Accessory eements include 3 sets of handcuffs, 2 walkie-talkies, a megaphone, 4 mugs, a camera, a lollypop stop sign, a crowbar, a wrench and 2 dynamite sticks for build and play fun.